Discussion in 'Announcements' started by Geti, Nov 28, 2017. A small "rolling" release on last build, fixing a few regressions and a small collection of fairly long-standing minor bugs. Nothing huge, but should set us up with a more clean slate for the next build. Entities that are inside an inventory no longer have the option to collide, which should improve performance on maps (and modded servers) with lots of blobs lying idle in storages. We feel that this is the expected behaviour anyway, but any modders affected by this please get in touch ASAP. New emotes work from the emote bindings config file, and emotes can be input there by name instead of by number (check EmotesCommon.as for the names). The emoticons have also been slightly reworked based on community feedback, though there's still a bit more work to do there! Note: they are not yet added to the emote menu because of an unresolved issue with the menu growing too large with so many emotes. We'll be looking at a few options soon. TDM map loading issues introduced by the map loading optimisations last build - no more missing chests or spikes, sorry about that folks! Unreliable crash on exceptionally small maps with minimaps turned on. Forever-broken emote menu if it was left open upon nextmap. This one had been in game since at least classic days, possibly as long as the emote menu has been around. Good to see it laid to rest. Map borders on "cave" TDM maps was incorrectly semi-transparent, which led to a strange seam at the top of the map. The semi-transparent border is still there for open-topped maps. There are also a few under-the-hood networking optimisations, and we'll be investigating more soon. [added] emote names for custom bindings + new emotes "work"
[modified] some mote emote changes based on feedback - still work to do though! Noburu, FuzzyBlueBaron, Cruxiat and 9 others like this. Now to use roll eyes emote! There's issues with the tile change batching code so I'm reverting it for now and will get to the bottom of it with asu tomorrow. Sorry for the disruption! E: fixed and tested for a game of CTF, seems like it works again! Guitarman, Varion and Tern like this. A million thanks for the constant improvements Geti! enderzilla747, Varion and Geti like this. Varion and Geti like this. Thank you, you beautiful devs. Note: they are not yet added to the emote menu because of an unresolved issue with the menu growing too large with so many emotes. We'll be looking at a few options soon. I know you probably thought about this (and though you devs always want to keep it simple input-wise...): How about clicking an icon ("Alternate") in the center of the emote wheel to alternate between the two versions. Since you dont use your click on the emote menu (and also cant attack while on it), it wouldnt generate problems. epsilon and Varion like this. 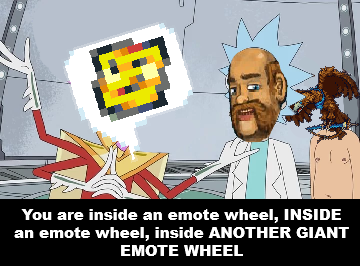 Or perhaps another emote wheel inside the existing emote wheel. enderzilla747, Biurza, Lava and 2 others like this. Biurza and Varion like this. Wouldn't be two wheels at the same time something kinda harsh to the eye? Yeti5000, Noburu, Magmus and 5 others like this. Magmus, Biurza, enderzilla747 and 1 other person like this. I don’t think it would be harsh to the eye. I feel like it would be more intuitive than the other suggestions. I feel like a 2 wheel solution could work as long as there's enough separation between the two "layers". Will need to prototype a few things. I'm honestly more in favour of a big grid as that'd be significantly more space efficient but I understand that people like the radial menu so we'll probably have to stick with that. epsilon and bunnie like this. but those are mooks, not bandits. It was originally going to be a replacement, but there was too much backlash so I kept both. I kind of like the subtle difference between them. why can you no longer pre-load before joining a server? What I mean is joining an empty server used to make joining any other non-modded server almost instant. Now there's no way to skip the "loading blobs" screen and joining all servers is slower. Same reason you can no longer join sandbox and then fly online - the cache is unloaded between all games. The persistent cache system caused too many issues. We may develop workarounds to reduce load time without introducing the previous vulnerabilities in the future, but it is not a priority. Osmal and bunnie like this.